Arlington, VA, November 7, 2011 – PBS brings cheer to families throughout the country this holiday season with new programming, both in primetime and for kids, beginning November 23. From The Nutcracker and a holiday concert with pop sensation David Archuleta, to an It’s a Wonderful Life-inspired episode of WORDGIRL and a week of chilly episodes of THE CAT IN THE HAT KNOWS A LOT ABOUT THAT!, PBS offers a variety of content to delight all ages. Award-winning pop sensation David Archuleta and actor Michael York join the renowned Mormon Tabernacle Choir in an energetic Christmas celebration of magnificent proportion. Recorded before audiences totaling 80,000 people, this spectacular event combines elegant dancing, masterful musical performances and storytelling. Complete with Yuletide favorites such as “Silent Night” and “Joy to the World,” the memorable performance also includes unique music such as “Los Pastores a Belén,” sung by David Archuleta in Spanish, and Michael York’s touching tale of the humble beginnings of the Mormon Tabernacle Choir, together with moving organ, choir and orchestra performances. This encore program is a highlight version of the six-hour Los Angeles County Holiday Celebration that took place in the Dorothy Chandler Pavilion of the Music Center on Christmas Eve 2009. The Los Angeles County Board of Supervisors has sponsored an admission-free holiday-themed show as a gift to the people of the county every December 24 since 1960. Attendance has become a seasonal tradition for many Angelenos. The 1,000-1,500 performers participating in the show each year represent the many cultures and holiday traditions found in the county. 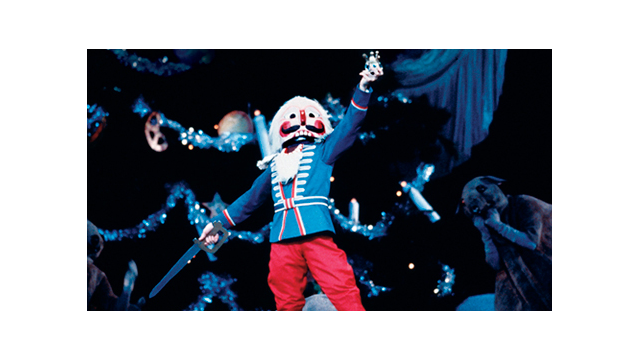 New York City Ballet’s beloved holiday favorite, George Balanchine’s The Nutcracker™, airs live from Lincoln Center’s David H. Koch Theater. Set to Tschaikovsky’s glorious score, Balanchine’s Nutcracker features New York City Ballet’s entire roster of more than 150 dancers and musicians, as well as two alternating casts of 50 children from the School of American Ballet, the New York City Ballet’s official school. In addition to Balanchine’s choreography, the seminal work features scenery by Rouben Ter-Arutunian, costumes by Karinska and lighting by Mark Stanley, after the original design by Ronald Bates. This new production of one of the nation’s most highly acclaimed annual musical celebration marks the 100th anniversary of the annual Christmas Festival from St. Olaf College in Northfield, Minnesota. Featuring St. Olaf’s renowned choirs and orchestra, the program’s rich blending of compositions will highlight selections from previous Christmas Festivals, including excerpts from R.V. Williams Hodie. Additionally, this centennial performance will debut newly commissioned works by American composers André J. Thomas and David N. Childs. Taped at the Schermerhorn Symphony Center in Nashville, Tennessee, nearly 700 student musicians join the host, the Belmont School of Music faculty and the Nashville Children’s Choir, to present this annual production of traditional carols, classical masterworks, world music and light-hearted seasonal favorites. The program will feature the University Symphony Orchestra, Belmont Chorale, Percussion Ensemble, Musical Theatre, Jazz Ensemble and Bluegrass Ensemble. This seasonal celebration also features a mass choir. The New York Philharmonic’s New Year’s Eve Gala celebrates the music of American 20th-century composers Leonard Bernstein and George Gershwin, conducted by Music Director Alan Gilbert, with star pianist Jean-Yves Thibaudet. Start the New Year with this glamorous evening featuring Bernstein’s Overture to Candide and Gershwin’s Rhapsody in Blue. Filmed live at Harrah’s Resort in Atlantic City, this holiday special is a journey through the decades of the pop songbook, including everything from doo-wop to contemporary pop done with the unforgettable Straight No Chaser twist. From “The Boys Are Back in Town” to “Joy to the World,” from “Billie Jean” to “You’re a Mean One, Mr. Grinch,” Straight No Chaser is the captivating sound of 10 unadulterated human voices coming together to make extraordinary music — all with SNC’s trademark harmonies and charm. The CURIOUS GEORGE Holiday Spectacular kicks off with the broadcast premiere of the original Curious George feature film, followed by encore presentations of “Curious George 2: Follow That Monkey” and “Curious George: A Very Monkey Christmas.” Descriptions and more details about these programs are available here. On a return trip to the North Pole, the Pteranadon family is caught in a snow storm — but did Don’s wish for snow make the storm happen? Then, while at the North Pole, the family stops by a Northern Troodon Festival of Lights to view the Aurora Borealis and join in an ice skating and singing spectacular. Blowing out her birthday candles after one too many superhero interruptions, Becky wishes for a world without WordGirl. She realizes her wish has come true and Chuck has become a king who has imposed strange rules. Will Becky find the last piece of enchanted birthday cake so that she can wish for the return of WordGirl and make things go back to how they were before? “Hooray for Hair” – Sally and Nick are getting their hair cut today; maybe they should try new hairstyles! A trip to meet three of Cat’s friends (and some styling help from the Wig-o-lator) will help them decide! Should they have yak hair? No, too hot! How about hair like a fur seal? Not quite, too short. A porcupine? No way! How will they ever get a hug from their moms with hair that spiky? They decide that the hair they have is what’s perfect for them! “Ice is Nice” – Nick and Sally want some nice cold lemonade, but there’s no more ice cubes in Sally’s fridge! A trip to Freeze-your-knees Snowland will fix that! They meet Cat’s friend Polly the polar bear who introduces Sally and Nick to all the different kinds of ice that make up her home. After trying many types of ice, they find the kind that will be perfect for their lemonade! Moishe Oofnik is selling 2,000 year old sufganiyot (jelly doughnuts traditionally eaten on Chanukah), and Anneliese is bringing her family's menorah to light at Shoshana's in celebration of the first night of Chanukah. Grover the waiter is serving levivot (potato pancakes or latkes), when he and Anneliese are both startled by Brosh and a chicken. Anneliese's menorah (a nine-branched candelabrum) goes flying. Anneliese can't find her menorah anywhere, so everyone helps her look. The pressure is on to find it before sunset, and everyone sings a song about the search. Finally, Avigail finds it and everyone heads inside to light the candles. In the end, the Sumsum crew lights the menorah together and sings a song. Descriptions of all program premieres and images are available at www.pbs.org/pressroom. Encore presentations of favorite holiday episodes from primetime and PBS KIDS programs will also air throughout December (check local listings). PBS, with its nearly 360 member stations, offers all Americans the opportunity to explore new ideas and new worlds through television and online content. Each month, PBS reaches 124 million people through television and 20 million people online, inviting them to experience the worlds of science, history, nature and public affairs; to hear diverse viewpoints; and to take front row seats to world-class drama and performances. PBS’ broad array of programs has been consistently honored by the industry’s most coveted award competitions. Teachers of children from pre-K through 12th grade turn to PBS for digital content and services that help bring classroom lessons to life. PBS’ premier children’s TV programming and its website, pbskids.org, are parents’ and teachers’ most trusted partners in inspiring and nurturing curiosity and love of learning in children. More information about PBS is available at pbs.org, one of the leading dot-org websites on the Internet, or by following PBS on Twitter, Facebook or through our apps for mobile devices. Specific program information and updates for press are available at pbs.org/pressroom or by following PBS Pressroom on Twitter. For images and additional up-to-date information on these and other PBS programs, visit PBS PressRoom at pbs.org/pressroom.